Every now and then we get a customer in the store who wants a very high power magnifier. Sometimes they bring printouts from other retailers that show some rather….unlikely high -power magnifiers with powers of 20x, 30x, even 50x. We unfortunately must inform them of the truth of these claims. The fact is – what is printed in the copy or actually on the magnifier is not true. You’ll note this has a rather generous 30x magnification, which still having a nice, wide 21mm lens width. Nonsense! The rules of optics are remarkably clear on this – the simple fact of the matter is that the more powerful a magnifier is (the higher its magnification) the short its focal length (the point where light rays passing through the lens meet on the other side of the lens) must be! And the shorter that focal length, the smaller the magnifying lens will be. A large handheld magnifier that probably everyone has in their drawer only provides about 2-3x and so has a long focal length of about 10″. Focal length equates to something known as ‘working distance’. What this means that you can use the magnifier about 10″ away from the thing you are viewing (this will vary slightly). However, as you increase the magnification of the lens, the focal length of the lens must be made shorter – this also means the diameter of the lens must also shrink or else your lens will become excessively thick and will have a distorting shape – think of looking through a crystal ball and how messed up that image is. Its a good example of a wide diameter lens with a very small focal length (a ball lens, ineffect). The diameter is just 18mm on this unit, and in order to avoid image distortion the lens is a triplet design – where three lenses are placed together to make a much better image than one lens alone would provide. As you can see, the higher power we go, the smaller the lens is going to get. In reality, our 30x lens shown up top should really be about 4-5mm in diameter. Not a very big lens at all. Truth to be told, barring some optical tricks (which I can assure these ’30X’ magnifiers do not employ) most magnifiers rarely go above 12-15x in power. That realm is reserved for low powered microscopes, which are a different optical beast altogether. Unfortunately, big numbers sell, and so manufacturers keep putting unrealistic figures on their products knowing that most people won’t know any better. The real tragedy is that most of these overplayed magnifiers are not bad products! 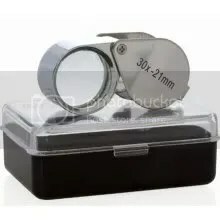 The 30X magnifier shown above is actually a decent 7-8X loupe magnifier. We’re even guilty at Spectrum of carrying a few of these ourselves – but in our product copy we note that the listed magnification is probably not accurate. We wish we didn’t have to do that, but we don’t like lying about a magnifier’s true abilities, we don’t like discarding a decent product, and our complaints to the manufacturer have fallen on deaf ears. So remember these words when you are looking for a high-power magnifier. Don’t get suckered in by inflated claims and be realistic about what your lens can do! Robotime Walking Robot Dinosaur Skeletons! We’ve seen plenty of wood dinosaur skeleton puzzles but this one is a new twist: They are robotic skeletons and they roar and walk! You put it together out of 70-85 pieces (depending on the model) and in addition to the skeleton there are also motors and battery pack (using 3 AAA batteries) that make the dinosaur roar, walk (in a shuffle) and in the case of the T-Rex, swing his tail! The neat part is that the robot is sound activated! Clap your hands and it will start walking and roaring! We (finally) got some meteorites at Spectrum Scientifics! These small meteorite samples hail from the Campo Del Cielo. This is a site where a substantial meteor struck back in 2,200 BC leaving a crater field some 2 miles wide, 12 miles long and with 26 different craters. The field was reported in 1576, but was then ignored for a couple of centuries when it was rediscovered and lead to study and collection of the meteorite pieces. Now some of those pieces have made their way to us. These are not tektites, these are genuine meteorites! Or at least pieces of them. 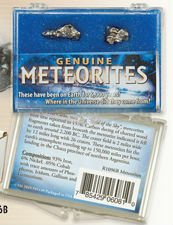 The smallest meteorites we sell are a pair of 1.5g meteorites in a small box. For a ‘closer’ feel we also have a meteorite pendant: a 5-6g meteorite pendant with cord necklace. Finally we have the actual meteorite pieces. These are boxes pieces, packed simply and easily removed from their display frontage. They come in three different sizes: 10 grams, 25 grams, and 40 grams. These meteorites are 93% iron, 6 % Nickel, 0.5% Cobalt and a small number of trace elements. Get some to add to your space or mineral collection! Just a little video while we are out! Floating Planets! Look Ma! No strings! Spectrum has added a new line of StellaNova Floating planet globes! These globes float using a computerized electromagnet. They are adaptable enough that breezes cannot disturb them and you can actually make the planets spin with a little spin! These are 6″ globes that are topped with a historic space probe that explored them! Let’s start with the Floating Moon Globe! Next up is the Floating Venus Globe, which shows what the planet would look like sans atmosphere. As well as a Floating Saturn Globe – with ring no less! Neptune globe is pending. No plans for a Mercury globe, however. Valentine’s Day Giant Microbes Sets! Need a really off-the-wall quirky gift for St. Valentines day? How about the new Giant Microbes Heart Warming Mini-Microbe Box set? It contains five different mini microbes! You get the mini Human Egg (ovum) Cell, The Sperm Cell, Kissing Disease (mono), penicillin, and a unique pink colored mini amoeba. Great stuff! But if Valentine’s Day is ‘Black Monday’ to you? What if you’ve had your heart broken or shattered? Giant Microbes has you covered with the Giant Microbes Heart Burned Mini-Microbe Set! Here you have five mini-microbes of all the elements from a (really) bad relationship: The Pox, Chlamydia, HPV, Herpes, & Penicillin! Both Heart Warming and Heart Burned are available for a limited time only! Be sure to get your in time for Valentine’s Day! The sheer, overwhelming amount of light pollution from a city can lead many of its inhabitants to believe that there is no way they can view anything from urban areas. Its not just residents who feel this way, I’ve even talked expert astronomy authors who have told me that there was no reason to get a telescope larger than 3″ diameter for city use as the light pollution would make that extra aperture useless. #1 means things like street lights, alley lights, that light your neighbor put up to light up the side of their house, etc that are pointed right at you or close enough to you to be an issue. Direct light mess up your eye’s dark adaptation and generally mean a poorer light experience. The easiest thing to fight this is to find a place with no lights – but in an age where cities work on the idea that ‘more light = more security/less crime” this can actually be more troublesome than you might think. So what can one do to fight these effects and enjoy some urban astronomy? Its a sad fact of life in the city: People rarely actually look up! And when they do, it is usually to admire some brightly lit building. But if you get in the habit of looking up in the sky at night you will start to notice that on clear nights there are objects in the sky that can be seen, and there’s more than just the Moon up in the sky! Getting into this habit will also let you spot the ideal nights for viewing. Of course, make certain you are not looking up at a tall building or street light first! The center area of any city is where its light are brightest and its building are tallest. Getting just a mile or two, or even just a few blocks away from brightest buildings can result in some surprisingly excellent views of the night sky. I myself have been able to naked-eye view the Trapezium in Orion (with averted vision) from both the Ferry Docks in Manhattan, as well as in Northeast Philadelphia! The vast majority of light in a city comes from its street lights. The trend in cities is to add more street lamps instead of removing them, so don’t expect them to go away anytime soon. But the good news is that most of street lights’ light is pointing down (and sadly, being reflected back up, but that’s another story). If you can get above these lights (which usually reach the third floor in most cities) by going on roof of a tall house or deck high above the ground you will avoid a large portion of the light pollution the city produces. Decks and roofs are not ideal for astronomy. Most decks are wood and prone to bouncing when you walk on them, your telescope image will shake accordingly if someone is moving around on your deck. In addition, not all roof decks have access that is easy to bring a telescope up to. Your mileage may vary. If you want a chance to see more than just the Moon and Planets, you will need to be choosy about which nights you want to do city observing. In addition to clouds, haze is a frequent factor in the night skies over cities in the warmer months and will spoil most viewing. The best nights for viewing will probably be in the Fall/Winter months. Amateur astronomers write volumes on getting their eyes to adapt to nighttime so that they can get the most out of their telescope viewing. They are, of course, assuming that you are working with excellent dark skies far away from any light pollution, but don’t let that fact put you off letting your eyes adapt. All too many urban astronomers walk out of their lit buildings and glance immediately up into the sky, without allowing their eyes any night adaptation whatsoever. This is not a good way to assess the night sky; instead give your eyes a few minutes to adapt to conditions. To do this avoid looking at any lights. You can sit in a chair and look up at the sky and you can actually see the effects: More and more stars will seem to ‘appear’. Its not that the city sky is improving, its just your eyes adapting to the night. The Moon: The moon is utterly unaffected by light pollution. In fact, even in the city you might consider using a Moon Filter as the light can be quite bright through a telescope. Keep in mind that the best time to view the Moon is when it is waxing or waning, not when it is full. Why? Because when the Moon is full the light is shining right down of the surface and so you get few shadows to show you details. The Planets: Jupiter, Saturn, Mars and Venus are also little affected by light pollution. You can enjoy the rings of Saturn as well the moons & bands of Jupiter with any decent telescope. Venus and Mars can also be enjoyed, however the former is very bright and shows only its crescent shape, wheras viewing the latter is often dependent on how close it is to Earth. Brighter Deep Sky Objects: You won’t get magnificent images of nebulea and galaxies, but you still enjoy them with a decent telescope. The Orion Nebula is one of the easiest objects to find in the night sky, while the Andromeda Galaxy can it least be partially seen on clear nights from the city. Make certain you have a decent star chart or Planisphere to pick your viewing targets. Urban astronomy will never match finding true dark skies far out in the country, but don’t let naysayers tell you that you “Can’t see anything in the city”. You most certainly can!